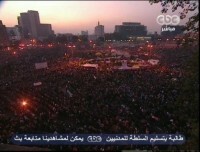 New Orleans Once again Tahrir Square in Cairo stands for dream of freedom, rather than the disappointment of struggle. Tens of thousands have held the square for days against scores that have died and thousands injured by the military. Finally, the demands have been clear and consistent and directed at the brazen power play in recent months by the military (known as SCAF, the Supreme Council of the Armed Forces), which has categorically proven that this is yet another institution in Egypt that cannot be trusted by the military. Having been in Cairo several months ago with the delegation from the Organizers’ Forum (www.organizersforum.org), it was impossible not to feel while we were there and in the weeks that followed the profound disappointment of so many of the activists and the increasing likelihood that the revolution’s aims might be lost even though changes would be felt for the future. The message to the military when we were there was inchoate and spoke more to the divisiveness of the protesters in the emerging politics, than to folks with their “eyes on the grape,” as we used to say. The push that finally began days ago in Cairo, as doubts continued to increase that the military was angling for a permanent role in running the country and being dilatory in the discussions of any real transfer of power to parliamentary and democratic rule, was led by the much maligned Muslim Brotherhood. Organizational discipline once again trumped social networking and political jockeying for power. The Brotherhood poured tens of thousands into the square and their commitment and discipline was deep enough to withstand the military attack and hold Tahrir Square, bringing tens of other thousands to fill the space in escalating protest and resistance. It is now the military that is forced to blink and retreat. With the announcement that the civilian puppet cabinet as offered to resign the military reads the writing on the wall: they either compromise or stand the chance of being institutionally crippled in the future. Heads will roll! One protester quoted in the Times pointed out the final realization of the irony that the military was thanked last January for not shooting the protesters as being the same as “thanking your wife for not sleeping with other men.” Correctly, one should have the right of a citizen to not expect your nation’s military to shoot you. The military seems to have forgotten this as well in these strange times. David Kirkpatrick of the Times, who has been an excellent source on some much of this, paints the Brotherhood as “reeling from the swift collapse of the military’s authority” in fear of there being a delay in the elections. This is a tactical hiccup in the face of a potential victory. There seems little doubt that the Muslim Brotherhood has not been immeasurably strengthened in recent days. In fact it seems clear if the revolution in fact is finally won that the protesters of all stripes will owe a huge debt of gratitude and grudging respect. We found a consensus that in elections the Muslim Brotherhood would be big winners, but a realpolitick assessment that they were too smart not to understand the lessons of the revolution and the lack of interest of the Egyptian people in suddenly living in a rigid theocracy. The Brotherhood is now incurring huge debts for saving the revolution, but hopefully they will not make the mistake the military made in January of ignoring how important the revolution is to all of the Egyptian people. This entry was posted in Organizing, Protests and tagged Cairo, Eqypt, Muslim Brotherhood, Organizers Forum, SCAF, Tahrir Square by wade. Bookmark the permalink.